John Henry is an American folk hero, notable for having raced against a steam powered hammer and won, only to die in victory with his hammer in his hand. He has been the subject of numerous songs, stories, plays, cartoons and novels. He had a 20 pound hammer that he thought was light, was 6 feet tall and weighed about 200 pounds. 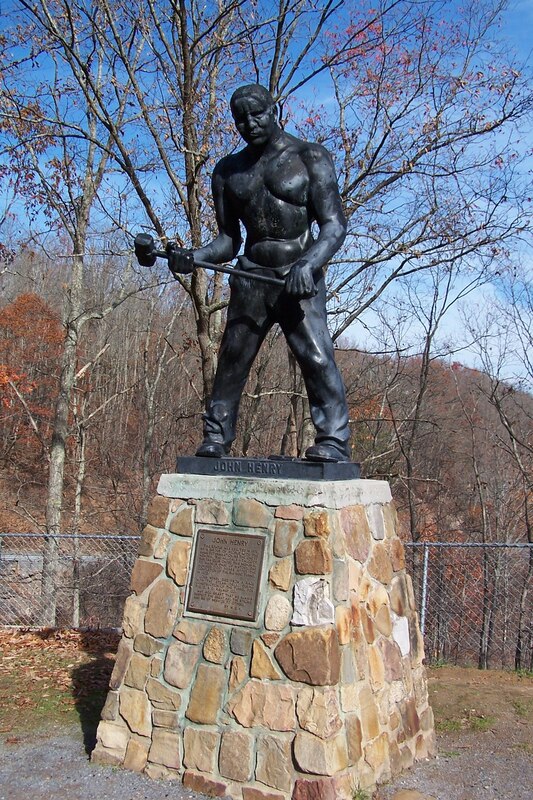 The truth about John Henry as the strongest man alive is obscured by time and myth and is the subject of much debate but one legend has it that he was a slave born in Missouri in the 1840’s and fought his notable battle with the hammer along the Chesapeake and Ohio Railway in Talcott, West Virginia. A statue and memorial plaque have been placed along a highway south of Talcott as it crosses over the tunnel in which the competition may have taken place. The railroad historian Roy C. Long found that there were multiple Big Bend Tunnels along the Chesapeake and Ohio (C&O) Railway. Also, the C&O employed multiple black men who went by the name “John Henry” at the time that those tunnels were being built. 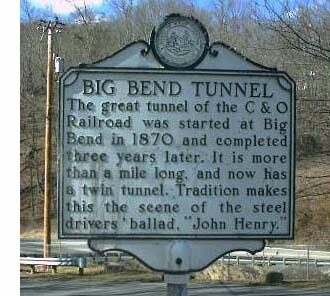 Though he could not find any documentary evidence, he believes on the basis of anecdotal evidence that the contest between man and machine did indeed happen at the Talcott, West Virginia, site because of the presence of all three key factors at the same time and place (a man named John Henry, a tunnel named Big Bend and a steam-powered drill). In Steel Drivin' Man: John Henry, the Untold Story of an American Legend, Scott Reynolds Nelson, an associate professor of history at the College of William and Mary, contends that the John Henry of the ballad was a 20-year-old New Jersey-born freeman called John William Henry. Nelson speculates that Henry, like many African Americans might have come to Virginia to work on the clean-up of the battlefields after the Civil War. Arrested and tried for burglary (numbered prisoner #497 in the Virginia penitentiary), he was among the many convicts released by the warden to work as leased labor on the C&O Railway. According to Nelson, conditions at the Virginia prison were so terrible that the warden, an idealistic Quaker from Maine, believed the prisoners, many of whom had been arrested on trivial charges, would be better clothed and fed if they were released as laborers to private contractors (he subsequently changed his mind about this and became an opponent of the convict labor system). ...workers managed their labor by setting a "stint," or pace, for it. Men who violated the stint were shunned ... Here was a song that told you what happened to men who worked too fast: they died ugly deaths; their entrails fell on the ground. You sang the song slowly, you worked slowly, you guarded your life, or you died. While on the subject of music, songs featuring the story of John Henry have been recorded by many blues, folk, and rock musicians of different ethnic backgrounds. Many notable musicians have recorded John Henry ballads, including: Joe Bonamassa, Furry Lewis, Pink Anderson, Fiddlin' John Carson, Uncle Dave Macon, J. E. Mainer, Leon Bibb, Lead Belly, Woody Guthrie, Paul Robeson, Pete Seeger, Van Morrison, Bruce Springsteen, Gillian Welch, Cuff the Duke, Ramblin' Jack Elliott, Johnny Cash and Jerry Lee Lewis. John Henry’s legend has not only appeared in song but in animation as well. Stop-motion animator George Pal made a 7-minute short called “John Henry and the Inky-Poo” in 1946. It was nominated for an Academy Award the following year for the best short subject/cartoon. In 1973, Nick Bosustow and David Adams co-produced an 11-minute animated short, The Legend of John Henry for Paramount Pictures. It featured narration by Roberta Flack, who also sings a song detailing the legend of John Henry. It was nominated for an Oscar in 1974 for best short subject animated films. In 2000, Walt Disney Feature Animation completed a short subject film based on John Henry, produced at the satellite studio in Orlando, Florida, directed by Mark Henn, written by Shirley Pierce and produced by Steven Keller. Keller, Henn and Pierce worked collaboratively with the Grammy Award-Winning group Sounds of Blackness to create all new songs for the film. The film also featured the voice talent of actress Alfre Woodard. The film won several film festivals both domestically and abroad and was one of seven finalists for the 2001 Academy Awards in its category. It also stars Tim Hodge, the future Big Idea Productions associate. Aside from film festivals, industry screenings and limited theatre screenings required for Academy Award consideration, a slightly cut down version of John Henry was released only as part of a video compilation entitled Disney’s American Legends in 2001. This became the nation’s top-selling children’s video for several weeks upon its release. Disney Educational Productions has also made the film available as a stand-alone product for video use in schools. The film is often shown on the Disney Channel, particularly during Black History Month. John Henry has not only appeared in animation but in live action as well (and no I'm not talking about the 1997 Steel Movie). In 1987 in the seventh episode of Tall Tales & Legends, a series created by Shelley Duvall for The Disney Channel, Danny Glover portrayed the historical figure. John Henry has also appeared in many books. Colson Whitehead's 2001 novel John Henry Days uses the John Henry myth as story background. Whitehead fictionalized the Talcott, West Virginia, John Henry Days festival and the release of the John Henry postage stamp in 1996. And of course, there is Steel who’s civilian name was not only inspired by the historical figure but who’s weapons (his hammer and rivet gantlet) were inspired by him as well.